Proximal femoral fractures include a broad group of common fractures of the femoral head and neck typically occurring in osteoporotic females. Mortality with these fractures can approach 20 % in the elderly. Two groups are commonly discussed: intracapsular and extracapsular fractures. Extracapsular fractures include intertrochanteric and subtrochanteric fractures. The intracapsular fractures include fractures of the femoral neck and head with capital, subcapital, transcervical, and basicervical varieties. The subcapital fracture is the most common of the four. The basicervical fractures include fractures farthest from the fovea. 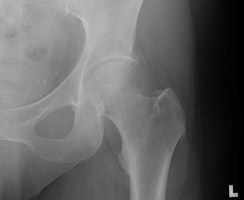 Intracapsular fractures have a high incidence of avascular necrosis of the femoral head (up to 35%). Nonunion of femoral neck fractures is common. The Garden staging system is used to classify femoral neck fractures based on the displacement of the femoral head based on the angle of the medial compressive trabeculae of the femoral neck and head components of the fracture. Garden I fractures are incomplete (possibly impacted) fractures with the femoral head in valgus position. These fractures are stable. Garden II fractures are termed complete but nondisplaced. The femoral head is mild varus position. These fractures are stable. Garden III fractures are complete, partially displaced. The femoral head is further in varus position with medial rotation. The femoral shaft is externally rotated. The fracture may be stable or unstable depending on the initial reduction effort. Garden IV fractures are termed complete with full displacement. The femoral shaft has superiorly and anteriorly migrated such that there is no approximation to the shaft. 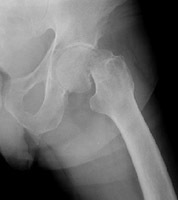 This is an unstable fracture with the highest degree of avascular necrosis of the femoral head. A AP radiograph of the left hip. 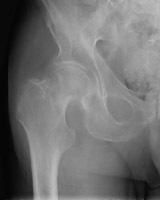 This shows an incomplete fracture of the femoral head, Garden I in staging. B AP radiograph of the left hip. There is a subtle band of sclerosis at the femoral neck. 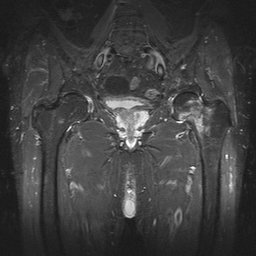 C Coronal MRI. This STIR sequence image shows intense signal in the left femoral neck region, due to fracture much more extensive than that predicted by the radiograph. This was a Garden II fracture. D AP radiograph of the right hip. This shows a Garden III fracture of the proximal femur. 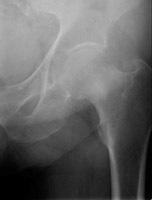 E Lateral radiograph of the left hip. This demonstrates a Garden IV fracture of the femur. 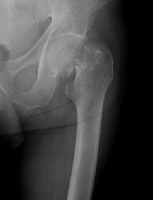 F AP radiograph of the left hip. This again shows the Garden IV fracture of the left femur.